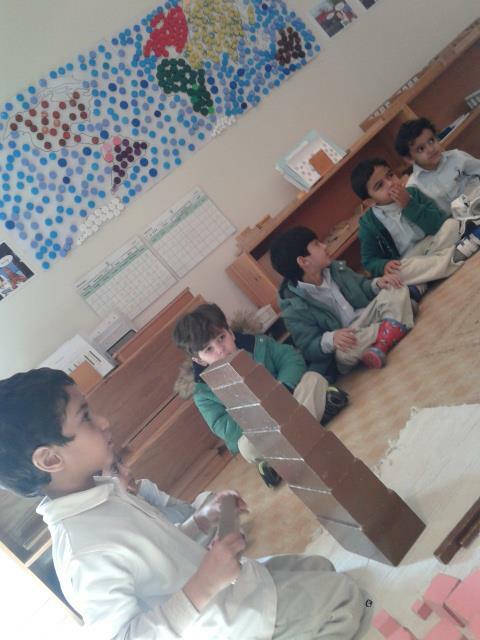 It was our usual Montessori day, and few of my little ones kept asking me," whats that Miss Erum? Can we make more buildings and towers out of the Pink Tower and Brown Stairs?" I said ,"Yes , why not , lets start making it now". 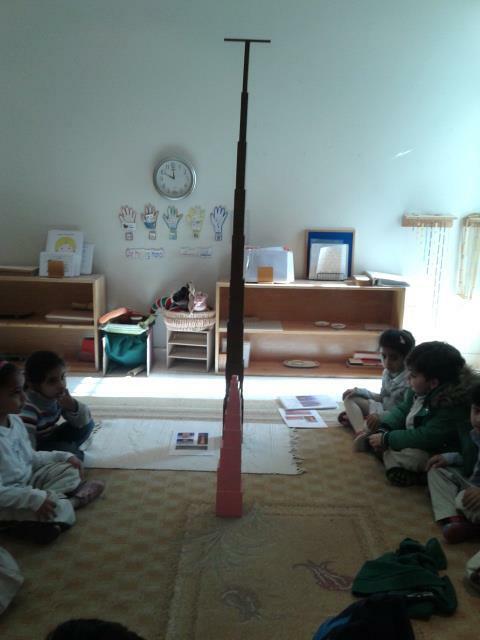 In a Montessori system of Education a child is free to choose his lessons, depending on how long he can concentrate happily. There is no limitation for time slot, it caters what each child needs to develop ; his confidence, creativity , problem solving and understanding of the world directly by using his Senses. 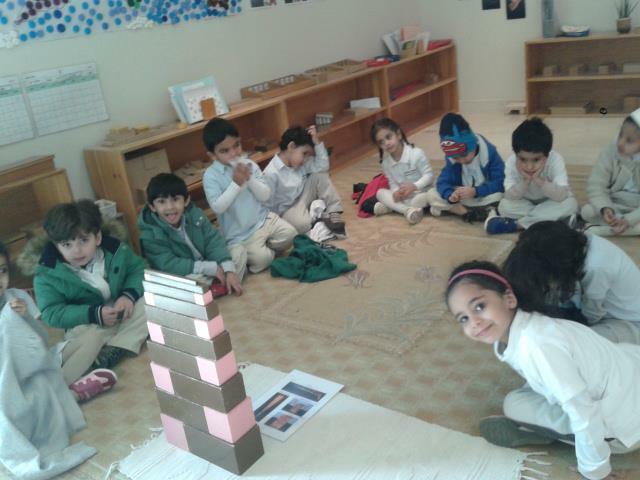 So we started our work and to my surprise a big group gathered around . In a Montessori , everything is a discovery, every minute is an AH-HA moment for a child. 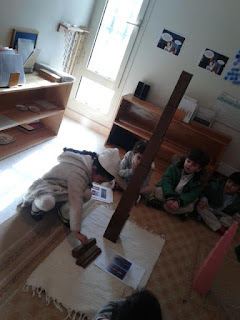 I started calling the interested children for different structures .This was our first Extention of the Brown Stairs that day. and now there is another structure appearing . every structure is a discovery for a child and a blow to his imagination. 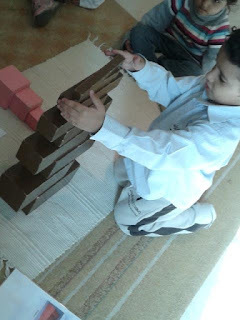 you can see this three year old's immense concentration in making this amazing structure. 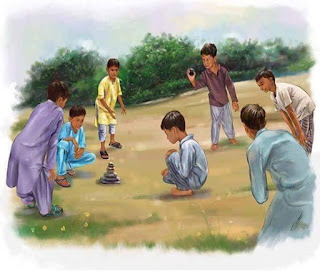 a child can be wonderous when he is given the opportunity to work with his hands as this is the only way towards enhancing creativity. now you can see the the ultimate structure. 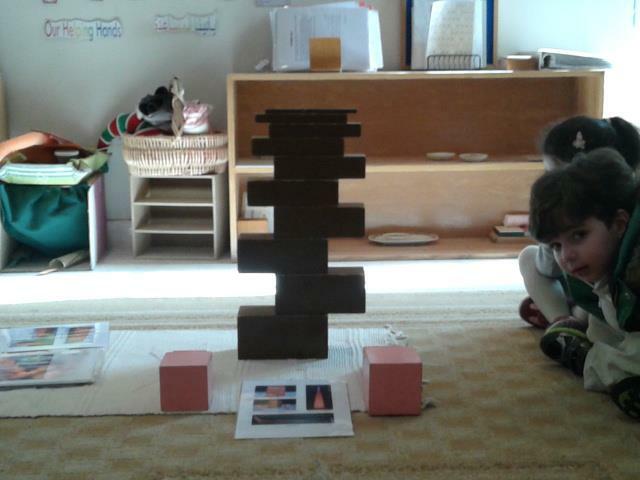 she was making a huge structure , every single step of putting the block adds a new pathway in a child's brain which actually creates new possibilities . 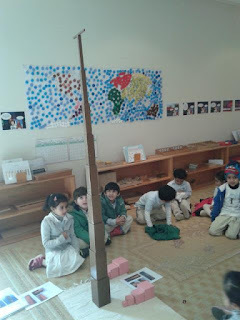 the amazing thing about the Montessori classroom is that things are same, but everyday a child discovers something new with each new interaction he makes with it. children are feeling an ah-ha moment because of the sensation they have after each amazing structure. 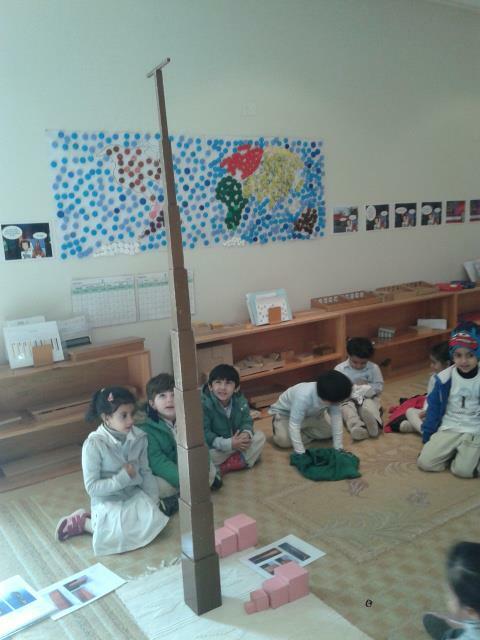 It pulls out the creativity in them which cannot be done unless the environment is there . Brown Stairs and Pink Tower provide the child with some amazing Formulas working beautifully in his mind . The Pink Tower is a set of ten wooden cubes measured precisely in increasing increments of 1 square centimeter with the smallest cube being 1x1x1cm and the largest 10x10x10. 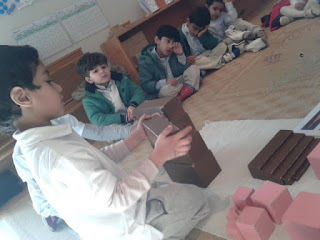 This sensorial work which for 3-6 year olds seems to be simply a block puzzle is translated later into the mathematical concept of the cubes of numbers from 13 to 103. 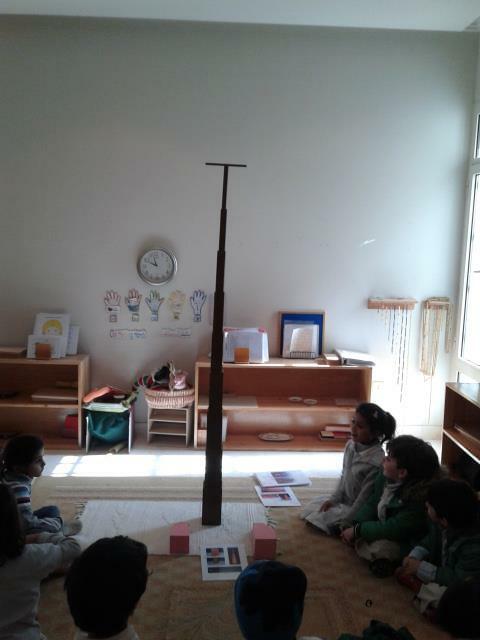 The Pink Tower also lays the foundation for the hierarchical decimal system of units, tens, thousands ,etc. 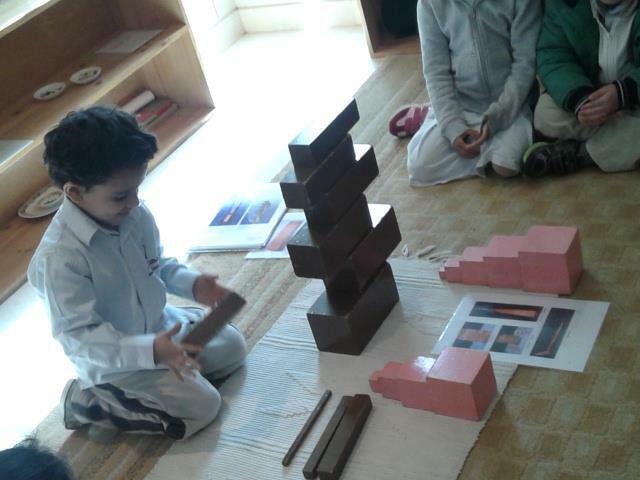 The Brown Stair is a set of ten wooden prisms all the same length of 20cm but graduated thicknesses with width and heighth from 1x1x20cm to 10x10x20cm. The BROWN STAIR PRISMS show differences in two dimensions - width and height while the length remains constant. When they are arranged they resemble a staircase with the narrowest in the front and the widest at the back. The Brown Stair Prisms sensorially represent the squared numbers 12, 22, 32, 52, 52, 62, 72, 82, 92. 102. If you view the end faces of the prisms you will see the squares of the numbers in the height and width changes. 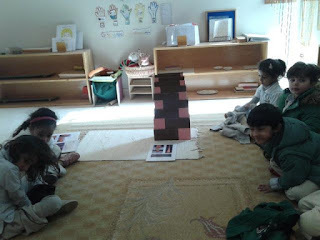 We all love PINK TOWER and BROWN STAIRS not because of their color but because it lights up every corner of a child's SENSORIAL antennas , giving him the different aspects of Geometrical and Mathematical clues, proving him the simple laws of Physics, and the power of Imagination and creativity when he start using them differently .